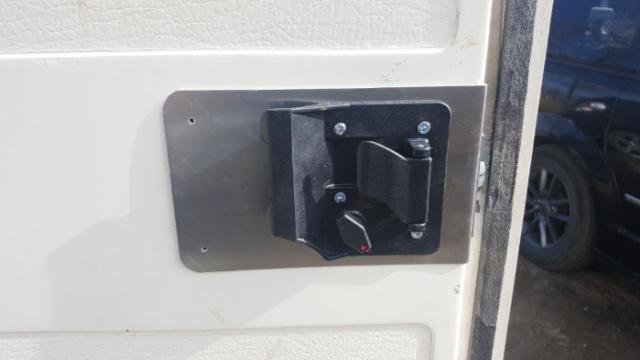 I bought and installed this hinge repair 2 camping seasons ago.There was a noticeable improvement in function and two years down the road it still works great. Well thought out , put together with quality parts. just wanted to say we received our Yellow Boler keychain and earrings (same color). They are lovely, great quality, nicely finished & just love the 2-dimensional effect of the keychain! Very Nice craftsmanship. Better than image shows on website, even better in real life. Got my door lock installed today; Took a bit more work than I thought it would based on your excellent video and instructions. My door had wood just below the old lock, so that all had to come out. But the lock fits and is installed and working. Now I can just push the door closed. It’s an excellent product and fit. The video helped immensely. The only thing i did different was use a Dremel to cut through the fibreglass instead of a jigsaw. Just received my keychain, its just wow ! bigger than i expect, high quality ! Just received my Camping Treasures in the mail – two Escape Trailer key rings – and am very pleased with them and your speedy mailing service. I just purchased an RV lot with 5th wheel trailer on it so I ordered these two key rings for my two adult children so that they can have their own keys to enjoy the RV resort on their own. So we will have a little \’handing over the key\’ ceremony this weekend. Your trailer key rings are so appropriate for this. 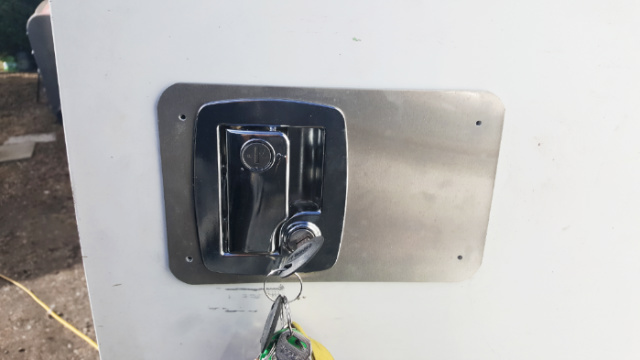 I just installed my new door lock on the Boler. It went pretty well as shown in the instructions. It took about 2 hours but I was double and triple checking everything along the way. (measure twice – cut once) as they say. What a huge improvement in both looks and functionality. It is well worth the time and money – good job. The customer service provided by this seller was exceptional. He went above and beyond to make sure that the earrings I ordered were delivered in time for Christmas. The product is fantastic too! Just thinking about this buying experience puts a smile on my face. I just checked my mail box and was very pleased to see my package – ordered Monday May 1st., had arrived this afternoon – May 5th. The white and yellow boler key chain is fabulous – very high quality and the door hinge bolt repair kit looks great. Can’t wait to get them installed. Many thanks for your immediate attention to my order and I highly recommend your products AND service to all my fellow boler owners. Will certainly use your services again. Finally got the gravel guard hardware put on the Scamp. The owner of the shop was impressed with your kit. Said it was a huge upgrade and that the locking system was super strong and sleek. I bought 4 Shasta trailer keychains and a set of wine charms from you the other day. I absolutely love them! They are really well done and very high quality. Thanks for making such excellent products. Glen T.
..handle is installed and fits great..ty very much! …took about 1 hr..just need to put in the rivets and its done..works well!